After installing VMware vCloud Director a couple of default roles are created. One of these roles is the “Organization Administrator”. 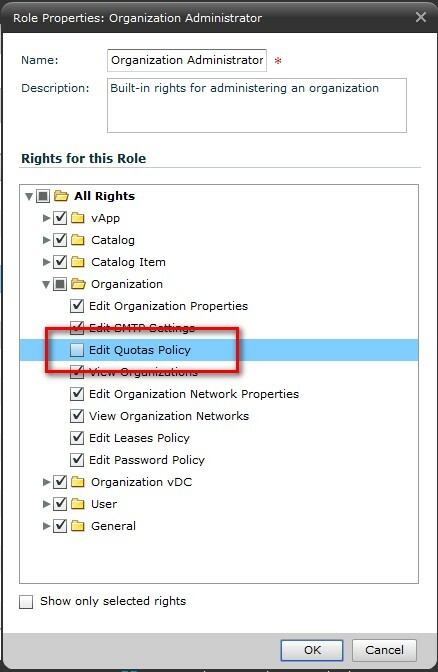 An Organization Administrator finishes setting up the organization by adding members and setting policies and preferences (from the vCloud Director User’s Guide). Actually, an Organization Administrator can configure everything within the boundaries of the organization: users, networks, resource usage and the vApps / VMs. I can imagine that in some situations you don’t want you Organization Administrator to determine how many VMs can run concurrently within the organization (s)he’s responsible for. It’s ok that the Org Admin decides how the available resources are used, but the number of running VMs is related to the required quantity of vCloud Director licenses: The more running VMs you have, the more licenses you need…Is this what you want? What are your ideas? Do you want to allow an Org Admin to set the maximum number of running VMs? Why or…why not? VMworld 2012 Session Voting is available…NOW!